This poem (written for children) beautifully exhibits the impulse to treat children as humans with experiences that are universal to mankind. 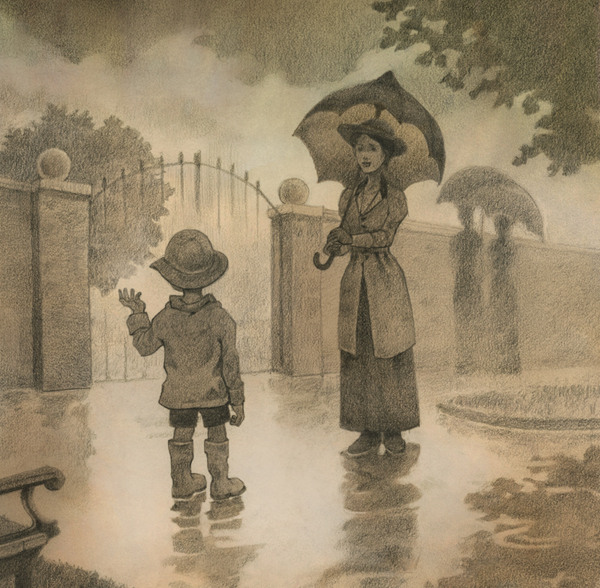 The rain described here seems to be a universal binder that unites a child in a park to the more romantic idea of ships at sea. I think this short poem displays simplicity without stumbling into triviality. It’s a good benchmark. Lovely drawing. That soft, tonal quality is something I’m trying to achieve in my recent drawings. Do you have any papers/pencils you’re fond of? I don’t use anything that special. The paper is Graphic Heavyweight paper from Graphic Chemical & Ink Co. I use whatever pencils are around. For this drawing I just used one of those disposable Bic pencils. I didn’t blend the graphite that much, but on a bigger drawing sometimes I use big graphite sticks and blend with tissues. Then I go back over and sharpen it a bit. I think sharpening it a bit at the end is the important part, because otherwise it gets to whispery and lacks structure. I’m enjoying your Inktober posts by the way. Awesome! Thanks Zach. I’m falling behind a bit on Inktober, but I’m going to catch up and try to finish strong. Glad you’re enjoying them! Do you have this image for sale anywhere, or how could I get a copy of it, please? It is beautiful.